There are times that a person is just overwhelmed by the kindness and care others show them. This week is one of those weeks. The Main Street Guymon Awards Evening took place on Tuesday and as I sat there and looked at the people sitting at the tables, I was humbled. 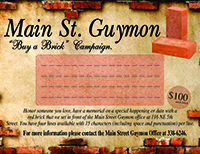 There are folks who are continually doing good things for others, who are taking care of their business without complaining, and stepping up over and over to make Guymon a better place to be. Most of them are involved in Main Street projects, but many of them are working outside of our projects. But they’re working. And we’re all benefitting. The Shutterbugs sat together and visiting, fiddling with their cameras and they made me smile. Cripes, Arlene Winfrey always makes me smile. She’s a hoot. Brown and Associates people had dressed up in the jungle theme and just added great to the evening. A bunch of the mobsters were there. Love seeing them. Love shopping with them. Love how they put into action “shop local.” They’re fun. Very deserving people received awards. Other deserving ones didn’t, but I bet they will sometime or in some other way. Or maybe just being a doer is award enough for them. One of the groups that didn’t receive an award, but who are so deserving of accolades is the Alma Folklorica Dancers. The day before they came in and decorated. They did it in less than two hours. How is it that high school kids give their time and energy to help like that? Then they tore down. Yes, I sat in my chair and talked with out – of – town guests while the Alma and some other volunteers tore down the decorations. They even made sure they went to the right places. It took them about 30 minutes. No kidding. A former Alma dancer also bought a ticket and came … and stayed and tore down. Yes, the Alma buy tickets to the banquet. And they work and work and work. They are a smooth working machine. Teri Mora, you are doing a wonderful job in teaching the Alma how to be better people and better citizens in addition to being better dancers. I love you for it and I am blessed every time I get to work with you guys. And every time I see a grown Alma and get a hug from them. You guys enrich my life and I believe you do many others, too. I loved our Jungle Party on Tuesday night. And I love and appreciate all of you who took the time to come out and support Main Street and it’s projects. Thank you for loving your town and caring. By the way, Virgil Gibson cooked mango / almond slaw, sweet chili cucumber seaweed salad, fried plaintains, teriyaki chicken on a bed of monkey brains and wrapped in a banana leaf, crab stuffed zucchini, Jamaican pigeon peas and rice, potato rolls, coconut cupcakes with banana ginger filling. It was a jungle paradise! To each and every one of you, may the rains sweep gentle across your fields. May the sun warm the land. May every good seed you have planted bear fruit. And late summer find you standing in fields of plenty.